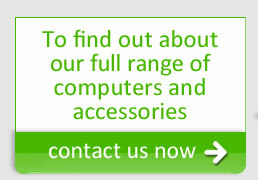 At Moortek not only do we supply quality laptops but also desktops of varying size and shape to suit all uses. The stereotypical desktop is now not the only option. There is a wide range of different designs, from desktops that are small enough to attach to the back of your monitor, to large gaming inspired towers, and everything inbetween. There are package deals available where a quality flat screen monitor can be included to match the system. Most systems include mouse and keyboard. Again our range is not just restriced to the consumer market as we can also supply business machines, in large quantites if needed, and machines suitable for educational settings. 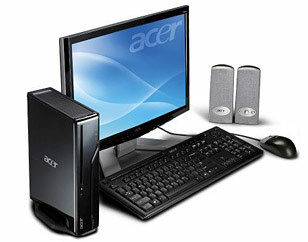 Along with the PC's we can also supply a large variety of monitors to compliment your desktop or even laptop PC. With Acer's patented CrystalBrite technology the glossy screen makes images and video alike stand out, looking truly stunning. Ranging in size from 19" to 24", in a square or widescreen format, in glossy black, white, or matte silver, there will be a monitor in the range to suit your needs.